The furore over the new Labour NEC Code of Conduct on Antisemitism. 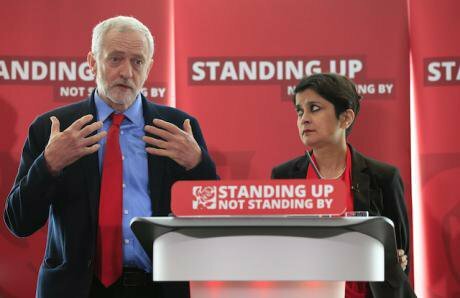 Jeremy Corbyn, alongside Inquiry chair Shami Chakrabarti, answers questions from the press following a speech on Labour's anti-Semitism inquiry findings at Savoy Place, London, June 2016. Jonathan Brady/ Press Association. All rights reserved. When the Labour Party released the text of the National Executive Committee’s new code of conduct on antisemitism on 5 July, did general secretary Jennie Formby expect the barrage of outrage, vilification and accusations of bad faith and betrayal that greeted it? The new code seeks to implement the June 2016 Chakrabarti Report’s recommendations, fulfil commitments made by Jeremy Corbyn to speed up disciplinary procedures after meeting representatives of Jewish establishment organizations back in April this year, to deal more robustly and efficiently with alleged expressions of antisemitism by party members and ‘to produce a practical code of conduct that a political party can apply in disciplinary cases’. It’s hard to believe, after the battering Labour has experienced over the issue of antisemitism in the party since Jeremy Corbyn was elected leader and the fact nothing the party has done has succeeded in fully placating its critics, that officials expected anything approximating universal approbation. But the new code had barely seen the light of day before it was being condemned in the harshest terms by all and sundry, and representatives of the Jewish Labour Movement (JLM), the official Jewish affiliate to the party, were complaining that they had been misled by the NEC and were never properly consulted over the new code. In some ways it was of little consequence whether or not there was anything in the slightest controversial in the new text. There is no shortage of politicians, media commentators, Jewish organizations and anti-antisemitism groups permanently primed to respond to each and every moment of antisemitism ‘news’ relating to the Labour Party. And on this occasion they launched predictable partisan salvoes at Formby and the NEC. Keith Kahn Harris sees it as one more chapter in the ongoing ‘Labour antisemitism saga’, but ‘saga’ hardly comes close. This is a war. A bitter, dirty war of attrition over what antisemitism is today. It began thirty odd years ago and the Labour story is but one part of it. A war with no end in sight. This is not a counsel of despair and should not be used as an excuse for remaining silent. It is true that, on both sides, so many minds are closed on the issue of Labour and antisemitism, the odds are stacked against changing anyone’s views. Nonetheless, some things need to be said so that where there has been mendacity, wilful distortion, political grandstanding and sheer inexcusable ignorance the record is at least set straight. Second, that the NEC code contravenes the Macpherson principle giving Jews the exclusive right to determine for themselves what antisemitism is. I do not undertake a critique of the IHRA’s definition, though readers should be aware that I believe it to be a deeply flawed document. (For two excellent analyses click here and here). Putting the record straight on the two assertions is quite straightforward. In both cases the evidence is easy to marshal. But while it seems entirely appropriate to set out the facts about the new code’s alleged rejection of the IHRA definition in as neutral a way as possible, the reverence in which it seems to be held, as if it were the holiest of holies, untouchable and possessing almost magical powers, has to be explained. Actually, its origins are highly controversial and the way it was adopted by the IHRA should make its vociferous promoters think long and hard about the wisdom of backing it with such blind faith. I briefly supply this explanation after setting the record straight on the two assertions. Apologies in advance if it seems to be a diversion from the main aims of this piece, but in my view this is crucial context, and I have always maintained, during thirty years of writing about contemporary antisemitism, that with this subject, context is everything. I conclude by discussing why those who claim to have the best interests of the Jewish population at heart – principally the leaders of major Jewish organizations – are so obsessively attacking the Labour left as the Jewish community’s most dangerous foe. And also why, by investing so heavily in this flawed definition, they have chosen a path of defensive, go-it-alone exceptionalism as the way of managing heightened fears of antisemitism, rather than pursuing open-hearted collaboration with other minority groups to fight the resurgent racism that blights society. Not one of these assertions of rejection is accurate. To assist in understanding what constitutes antisemitism, the NEC has endorsed the definition produced by the International Holocaust Remembrance Alliance (IHRA) in 2016. You will note from the quotes in my paragraph above, however, that some critics speak of ‘Labour’s refusal to adopt antisemitism definition in full’ or that ‘the code does not fully adopt’ (emphasis added) the IHRA definition. So given that the code endorses the 38-word definition in full, what can it then mean to claim that the NEC does not adopt the definition in full? Manifestations might include the targeting of the state of Israel, conceived as a Jewish collectivity. However, criticism of Israel similar to that levelled against any other country cannot be regarded as antisemitic. Antisemitism frequently charges Jews with conspiring to harm humanity, and it is often used to blame Jews for ‘why things go wrong.’ It is expressed in speech, writing, visual forms and action, and employs sinister stereotypes and negative character traits. Contemporary examples of antisemitism in public life, the media, schools, the workplace, and in the religious sphere could, taking into account the overall context, include, but are not limited to . . .
which is followed by 11 such examples. So the critics who claim that the definition in full has not been adopted are referring to the additional text, principally the 11 examples, 7 of which relate to Israel and/or Zionism. And while the NEC code is content with 9 of them, it comments and suggests amendments to some of the others and only omits the one that relates to claims about the state of Israel being a racist endeavour. (As Jon Lansman points out, this is a subset of an example, not a standalone one.) Is it therefore true to say that the IHRA working definition has not been fully adopted? Is it therefore true to say that the IHRA working definition has not been fully adopted? The vast majority of people who would read this document and all the comment surrounding it are not in a position to divine any hidden motivations of those who devised and drafted it. So we have to begin by taking the entire document at face value. And it could not be clearer as to what is and what is not part of the definition. Gardner claim that ‘the definition is a single document, but Labour treats it as having two parts.’ But the definition, in bold type, is enclosed in a box headed ‘non-legally binding working definition of antisemitism’ and is wrapped in quote marks. Where the language of the definition is definitive – it could hardly qualify as a definition if it wasn’t –the language of the additional text providing examples is more circumspect, more conditional, using phrases such as: ‘might include’, ‘could include’, ‘taking into account the overall context’, ‘not limited to’. In other words the manifestations or examples of antisemitism given may or may not qualify as antisemitic, and they do not constitute an exclusive list. There may be more, perhaps many more, categories. These are very important caveats, but they are hardly the stuff of a definition. We have to assume that had the IHRA wanted the examples to be formally part of the definition, surely they would have said so. There is little doubt that the IHRA wanted the examples given to be seen as antisemitic, but they seem to have been canny enough to understand that statements, the meaning of which depend on the ‘overall context’ in which they appear, can hardly be part of a definition that seeks to be definitive. So the document containing the working definition is a single entity, but it is unequivocally separated into two parts: definition and supporting, conditional examples. The second ‘killer’ assertion about the NEC code is also based on an accusation of Labour’s alleged rejectionism: this time its denying of the validity of a supposedly standard understanding of who has the last word in determining the nature of prejudice against any minority group. In a letter sent to Jennie Formby on 10 July, the professional heads of the Community Security Trust (CST), the BoD and the JLC state: ‘It is for the Jewish community to decide what does and what does not constitute racism towards us, just as any other groups has the right to do.’ ‘This attempt at defining prejudice on behalf of the Jewish community in the face of our clear advice constitutes a significant departure from established anti-racist [principles] that will worry all minorities’. This apparent iron rule, as Freedland indicates in his tweet, is derived from the report of the Inquiry into the conduct of the police in investigating the killing of the black teenager Stephen Lawrence, conducted under the chairmanship of Sir William Macpherson and published on 24 February 1999. It is claimed that the Macpherson report produced a definition of racism that conferred the right on any minority to be the sole arbiters of what constitutes the racism they experience. Thus, it’s for Jews alone to define what is antisemitism. The problem with this claim is that Macpherson produced no such definition. And yet it continues to be made indignantly and insistently by Jewish groups no matter how often it is clearly proven to be a misreading of the 1999 report. And even as I write, there is news that the Jewish Labour Movement is presenting to the party on 17 July legal advice claiming that Labour may have breached the equalities act by ignoring the so-called Macpherson principle in its new NEC code of conduct on antisemitism. As I explained in a piece for openDemocracy in June 2011, in connection with accusations levelled at the time against the Universities and Colleges Union that by rejecting the EUMC working definition of antisemitism they were denying Jews the Macpherson-conferred right to define it for themselves, the only definition of racism Macpherson produced was of institutional racism. However, he did also define a racist incident, describing it as ‘any incident which is perceived to be racist by the victim or any other person’. But this was a specific instruction to the police that the victim’s perception of the motive for an attack is what the police must record as the motive for the attack. The intention of providing this definition was to change police culture prevailing at the time, which systematically failed to take heed of the experience of victims. But there is nothing in the report suggesting a move from a specific and very important rule about recording the victim’s perception of what occurred to a general rule that only the victim can define the racism they experience. The Stephen Lawrence Inquiry definition of a racist incident has significantly influenced societal interpretations of what does and does not constitute racism, with the victim’s perception assuming paramount importance. CST, however, ultimately defines incidents against Jews as being antisemitic only where it can be objectively shown to be the case [emphasis added], and this may not always match the victim’s perception as called for by the Lawrence Inquiry. CST takes a similar approach to the highly complex issue of antisemitic discourse, and notes the multiplicity of opinions within and beyond the Jewish community concerning this often controversial subject. More fundamentally, if we rest our definitions of racism on the perceptions of minority groups then we open the way to conceptual and political chaos. For if the identification of racism becomes a matter of subjective judgment only, then we have no authority other than the perception of a minority or victim group with which to counter the contrary subjective opinions of perpetrators who deny they are racists. Without an anti-racist principle which can be applied generally we are left in a chaotic situation in which one subjective point of view faces another. Note the measured tone of the CST’s statement in 2009 and the intemperate, accusatory, intolerant and angry tone of CST missives and blog posts about the current controversies concerning the Labour party, a tone echoed also in BoD and JLC statements. The IHRA working definition was not something freshly minted in 2016. It’s a revamped version of the ‘working definition’ of antisemitism developed in 2004 in controversial circumstances under the auspices of the now defunct European Union Monitoring Centre on Racism and Xenophobia (EUMC). At the instigation of the American Jewish Committee (AJC), the EUMC director organized a meeting of Jewish representatives to discuss a new definition of antisemitism already drafted by the AJC’s leading expert on the subject, Kenneth Stern. The essential element in Stern’s draft definition was singling out certain forms of criticism of Israel and Zionism as antisemitic. The initiative followed the leak of a 2002 EUMC report on antisemitism in Europe, which the EUMC Board had decided not to publish, allegedly because it provided evidence of increased antisemitic attacks perpetrated by young Muslims. The Board did not think it wise to release such information. Jewish groups were furious about the alleged suppression of the report and the EUMC was mired in the controversy for two years. The AJC saw an opportunity to ensure that the suppression of such data would not take place in the future by crafting a definition of antisemitism for use by the EUMC which was rooted in the notion of the ‘new antisemitism’ – that Israel was now the Jew among the nations. Only people sympathetic to this point of view were invited to attend the meeting. (I reveal the full story of the origin of the EUMC working definition on my blog here). The EUMC document separated the definition from 11 examples, presented as two separate groups. The first 6 featured well-known antisemitic tropes. The following 5 were prefaced by this sentence: ‘Examples of the ways in which antisemitism manifests itself with regard to the state of Israel taking into account the overall context could include’. The EUMC working definition was heavily promoted by its instigator, the AJC, other major American Jewish organizations, national Jewish representative bodies, Jewish defence organizations, the Israeli government, pro-Israel and Israel-advocacy groups, and was given the seal of approval by the Organization for Security and Cooperation in Europe (OSCE), as well as some other pan-European Jewish and general organizations. But the EUMC working definition was widely criticised and the organization itself was put under much pressure by both supporters and critics of the definition. When questioned, the body increasingly claimed that it was neither wholly endorsed by the EUMC itself – it was only on its website as a guide and a basis for discussion – nor was it in any sense the EU definition. Eventually, the EU decided that the EUMC was no longer fit for purpose and replaced it with the Agency for Fundamental Rights (FRA). The FRA effectively abandoned the working definition. When questioned on the matter, the FRA said: ‘Since its development we are not aware of any public authority in the EU that applies it [and the] FRA has no plans for any further development’. In an August 2010 publication on antisemitism it didn’t even mention the working definition. Then, as now, promoters of the definition played fast and loose with what actually constituted the definition. When it was attacked by people criticising some or all of the 5 examples of where Israel comment could be antisemitic, defenders of the definition said: ‘But the examples are not part of the definition’. Nevertheless, many Jewish bodies promoting the working definition made no distinction between the definition text and the rest of the document, claiming that the entire document was the definition. Rarely did any other supporters of the definition contradict them. The promoters and supporters of the EUMC working definition were never reconciled to it being set aside by the FRA. And in a climate of growing, murderous jihadi terrorism and perceived worsening antisemitism they found a sympathetic hearing among European political leaders. The path to the revamping and adoption by the IHRA is traced by Ben White in his new book, Cracks in the Wall: Beyond Apartheid in Palestine/Israel published by Pluto Press. ‘At the Israeli-government convened GFCA [Global Forum for Combating Antisemitism] in Jerusalem in 2015,’ writes White, ‘a working group recommended “that the Working Definition of Antisemitism be reintroduced into the international arena with the aim of giving it legal status”.’ Mark Weitzman, an official at the Los-Angeles-based Simon Wiesenthal Centre, a body which makes no distinction between fighting antisemitism and defending Israel, took up the task in his role as chair of the Committee on Antisemitism and Holocaust Denial for the IHRA. Under his chairmanship, in 2015 the committee proposed a definition which almost exactly replicated the discredited EUMC working definition. In May 2016, the IHRA formally adopted it. There is much in this story of the controversial – even rather grubby – origins and revival of the infamous ‘working definition’ to explain why there are very good reasons for not taking the IHRA definition at face value and, at the very least, for exercising judgment as to how the examples relating to criticism of Israel might be used. The Los Angeles Simon Wiesenthal Centre, the institutional home of Mark Weitzman, the man who masterminded IHRA adoption of the working definition, publishes each year a list of the ‘Top Ten Worst Anti-Semitic/Anti-Israel Incidents’—making no distinction between the two. In 2015, 3rd on the list after ISIS, was the EU’s decision to correctly label the origin of products made in Israeli settlements in the occupied territories. And in 8th place were Jeremy Corbyn and the late Gerald Kaufman MP. Would any thoughtful, progressive person with Jewish interests at heart buy a definition from the Wiesenthal Centre man who sold one to the IHRA? What has led to this extreme defensiveness, this unprecedented and unbalanced all-out assault on the Labour Party, which has undoubtedly made mistakes in its handling of the issue of antisemitism in the party, but which nonetheless retains a significant level of Jewish support, I would guess particularly among younger Jews? JC editor Pollard, musing on who ‘would be on the shortlist of the least suitable people to draw up a definition of antisemitism’, implies that the Labour Party would not be much better than the Nazis. The CST’s Gardner makes this damning indictment: ‘IHRA rejection is now fundamental to [Labour’s culture]. It represents and repeats the same far left ideological, emotional and systematic rejection of our concerns that we have faced for decades. It is what moved JC editor Stephen Pollard to accuse Labour of “institutional antisemitism”’. And why, almost ten years after implicitly acknowledging that the understanding of what Macpherson wrote was wrong, has the CST reversed its view and now, together with the BoD, the JLC, government ministers, sundry politicians etc., blatantly repeats an egregious misreading of Macpherson? Seven deal with criticism of Israel. Some of the points are sensible, some are not. Crucially, there is a danger that the overall effect will place the onus on Israel’s critics to demonstrate they are not antisemitic. The home affairs committee advised that the definition required qualification ‘to ensure that freedom of speech is maintained in the context of discourse on Israel and Palestine’. It was ignored. In my view, Jewish leaders can no longer identify who are the enemies of Jews or unequivocally support the kind of social and political order in which all who live in a country are entitled to equal human, civil, political, social and national rights. By increasingly throwing in their lot with people promoting the notion of the ‘new antisemitism’, they have found themselves wittingly or unwittingly making common cause with racist and Islamophobic forces which profess to love Israel. Thus loving Israel has become the proof of Jewish loyalty and, in effect, those who cannot express this love – Jews and non-Jews – are the symbols of today’s antisemitism. Prime Minister Benjamin Netanyahu, is doing more to legitimise antisemitism in Europe today than any expressions of anti-Jewish sentiment emanating from the left. Meanwhile, the leader of the country that the organised Jewish community – here and elsewhere – spends so much time, effort and financial resources defending, prime minister Benjamin Netanyahu, is doing more to legitimise antisemitism in Europe today than any expressions of anti-Jewish sentiment emanating from the left. He supports Hungary’s populist prime minister, Victor Orban, who has mobilised dangerous antisemitic sentiment against the liberal Jewish philanthropist George Soros. He’s given the Polish government a free pass on its legislation criminalising opinion and scholarship which shows that Polish people were complicit in the Holocaust. He’s been happy to fraternise with far right party leaders in Europe and the American Christian right which loves Israel but sees left-liberal Jews as enemies. And he has turned a blind eye to President Trump’s tolerance of antisemitic forces, judging this a price worth paying for Trump’s essentially uncritical support for the Jewish state and effective abandonment of any solution to the Israel-Palestine conflict that recognizes and realizes Palestinian rights. In other words, setting the pursuit of extreme right-wing Zionism as a higher goal than the safety and security of American Jews. Or French Jews. Or British Jews. Or any Jews not living in Israel. Having completely bought into the notion of the ‘new antisemitism’, as enshrined in the IHRA document, it is very difficult for Jewish leaders to now take a stand against the government of the Jewish state’s pursuit of extreme nationalist policies. In these fragile times, with young Jews increasingly distancing themselves from Israel, strong challenges to traditional Jewish leadership from aggressive right-wing Jewish groups and deep-seated fears of jihadi terrorism, Jewish leaders have, in their uncompromising reaction to the NEC’s new code, responded by doubling down on the sanctity of the IHRA definition. They claim exclusive rights to determine what is antisemitism, potentially putting Jewish sentiment, and unwittingly the sentiment of any minority group, above the law of the land. Jewish leaders are struggling and failing to come to terms with new realities. They are choosing the utterly counterproductive path of isolation and exceptionalism, painting their community into a corner, making impossible demands for the eradication of anti-Semitism – which, like all racisms, can be fought and radically diminished, but will sadly always be with us – positively legitimising Jewish fears and doing nothing to discourage the narrative of exit one hears from family and friends as an answer to the insecurity Jewish leadership itself is exacerbating. Attacking the Labour party and investing all in the IHRA working definition of antisemitism is just making matters worse. This is the time to take the path to working with other minority groups, civil society organizations and human rights bodies to confront antisemitism within the context of a wider antiracist struggle, not to perpetuate the notion that Jews stand alone.